They may be political allies, but Turkey’s Prime Minister and President have entirely different views when it comes to Twitter. A court order which would have required the social network to remove certain links from the site was ignored by Twitter. As a result, Prime Minister Tayyip Erdogan announced that he would “eradicate” the website. Not long after he made that statement, the site was blocked throughout the country. Even though there are tons of people within Turkey who have found ways to get back onto Twitter, the ban is still in effect. The ban is directly tied to Erdogan so it is not surprising that other members of the governement are not on board with banning a service that 10 million citizens use. Although there are court orders, they deal with links to a variety of recordings that appear to show corruption in Erdogan’s office. Knowing that this would hurt his political future, Erdogan has banned Twitter and has even stated that he wants to go after YouTube. Social media has taken a hit throughout the Middle East and in other areas around the world. Knowing that incriminating videos, pictures, or text, can go viral on these sites, governments have blocked them in futile attempts to suppress information. Perhaps the biggest in-your-face moment of the internal conflict between Turkey’s Prime Minister and President was Gul’s decision to use Twitter to show his support for the social network and others like it. Question – Do you think access to Twitter will be restored in Turkey soon? Summary: Turkey’s President has gone against the Prime Minister’s ban on Twitter. 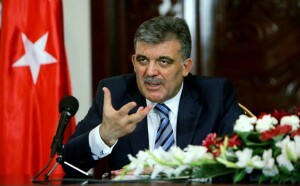 President Abdullah Gul used Twitter to state that approval to shutdown all social networks will not be given.